Infographics are a great learning tool; they help information sink in a little better, and that certain thing we’ve heard countless times before but never got our heads around it, can finally be processed properly with a visual aid. A good infographic demands more creative input in the presentation of information to make it instantly understandable. Also, some infographics (like the one below) are just plain awesome. Before you continue, I bet you’d want to check out this solution to help you put and end to Salesforce user confusion. 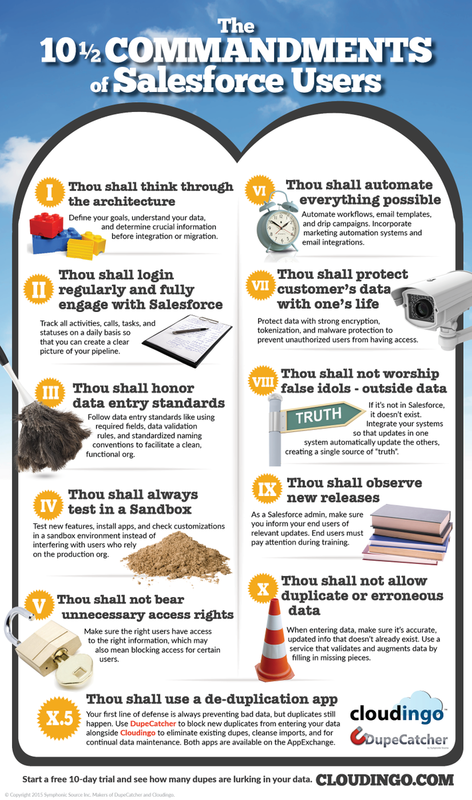 This great piece of visual goodness from Cloudingo presents the 10 commandments every Salesforce user needs to follow. Make sure every single one of these practices is present in your work routine- if one is missing, try it! You’ll see the results for yourself quite soon.